Uh oh, I can almost sense the ornaments fear at this news, expect more breakages as our footie faithful get "into the game". Konami went on to explain how integral the Wii pointer would be when dribbling and passing the ball. This news confirms Konami's dedication to making PES a fully fledged Wii game, we just hope they've done enough research and development into perfecting these controls, it sounds like it could really make or break footie games on Wii. Similar to Mario Strikers Charged Konami have opted to include "shakes" for tackles. The new system gives the player full control over their team, and allows the man marking of specific threats, while shakes of the Wii Nunchuk can be used to perform sliding tackles, and send the goal keeper out to clear a loose ball. The strategic elements are also easily accessed, with the directional controls of the Wii Remote used to activate tactical plays and spring counter attacks or send players tracking back. Along with the new control system the developers have included full support for Mii's and online play against friends or random players. Full Mii support is also present, and users can integrate up to 16 pre-defined Miis into a team, while the ever-changing teams can be stored on to the Wii Remote and switched between two linked Remotes. 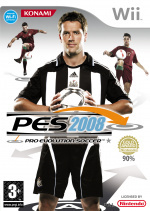 PES 2008 also has a strong online element, allowing users to play ‘Free Matches’ against unknown opponents, or ‘Friend Matches’ against people on the Wii’s Friends list. Team data can also be sent to friends via the console’s WiiConnect24 system. Pro Evolution 2008 is currently scheduled for release on Wii for March 2008. We'll of course keep you updated with the latest news as and when we get it, expect a full review at release. ... ptsh! Where is Rugby 08 I say! Sounds awesome, and a demo video I have seen shows that it has the possibility of being awesome. I will probably be trading in FIFA 08 Wii for this! LOL.